Several decades ago, it was, that I volunteered at a local Zoo and Aquarium, back in a day when volunteers who proved that they would work hard and who showed a knack for working with the animals could become assistant zoo keepers. I had the great fortune to be one of those volunteer zoo keepers and, after paying my dues shoveling musk ox doo doo [looks like milk duds] and cleaning out the bottom of the otter pool [foul, foul, rotting fish and shell fish remnants], after cleaning up in the wolf enclosures, with the wolves watching silently from the corners, and staring for hours at our little clone-like penguins trying to find distinguishing marks, I was at last transferred to the area where the marine mammals lived. And there I met Mayak, a wonderful, temperamental, bright female beluga whale. She is the model for the beluga in my book. This is Mauyak. She is shorter than average, and was always a little roundish. 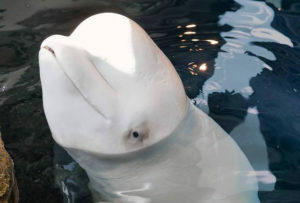 Belugas are born usually a deep gray and lighten to white at maturity.  But little bits of gray pigment sometimes remain here and there in an adult. Mauyak was captured in 1984, at a young age. That makes her over 32 years old today. 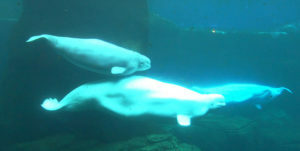 At that time, the belugas were under a captive breeding management program, meaning that at all the participating facilities, active steps were being taken to breed more belugas. Mauyak and the big male Inuk had been together at our facility for a number of years. 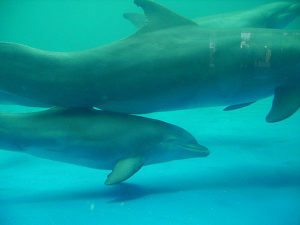 Mauyak had become pregnant several times, and in each case she lost the baby. 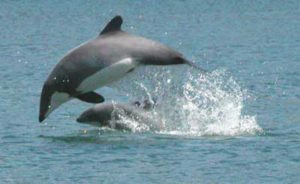 She was pregnant when I arrived for volunteer duty at the marine mammal area, and she was destined to lose that baby as well. The baby arrived live. I was there to see it. Mauyak helped the little guy to the surface, as belugas do, since the baby must take its first breath of air soon after the live birth. But the baby floundered. It seemed weak. It had trouble breathing on its own. It sank to the bottom. Staff biologists, at the ready, jumped into the water and pulled the baby out, trying to revive him on the concrete beach. No good. The last thing Mauyak would see was her baby being carried from that beach. No one could explain to her, of course, what had happened. For weeks I watched her circle her pool incessantly, a sure sign of distress. Almost every time she completed a circle she would lift her head above water to check that same beach and see if the baby had been returned to the last place she’d seen it. All volunteers at the zoo at that time took a number of classes — and a number of exams based on those classes. We learned then that in the wild mother belugas have been observed carrying on their backs the bodies of babies that didn’t survive, carrying them until there is virtually nothing left of the little creatures. Mauyak had no baby’s body to carry with her, but she must have had the same instinctive need, call it grief if you are so inclined, because she adapted one of her toys, a large faded-orange round buoy with a short thick rope attached to it for the same purpose. Day after day, she carried that buoy on her back. She carried the toy so carefully, so diligently that once, when I was cleaning the beluga underwater viewing area, I heard a watching woman ask her husband why the zoo had nailed the buoy to her like that. It broke my heart to watch her. 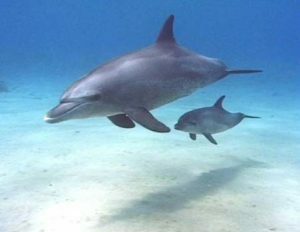 Say what you will about anthropomorphism, you will not find a person in the world who has watched a dog or cat or great ape or monkey or polar bear or whale or dolphin with their offspring who doesn’t agree that they are not only mothers in fact, they are good, caring mothers. And so it is that I honor them today, especially my once-and-always friend Mauyak. No one knew why, precisely, Mauyak couldn’t successfully have babies at our zoo. But one possible culprit was the size and/or shape of our beluga enclosure, which was comprised of three interconnecting pools, only one of which was particularly large, given that all whales and dolphins spend vast amounts of time swimming over great distances. To test whether the pool size or shape could be the problem, both Mauyak and Inuk were shipped off to the Shedd Aquarium in Chicago. And there, I am happy to report, Mauyak has given birth successfully. As I understand it, she and a daughter born almost four years ago are there even today. 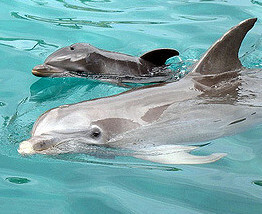 A four year old is still considered a young juvenile among cetaceans, so I expect she is still quite close to Mauyak. 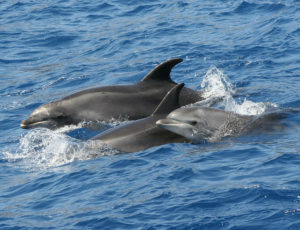 I Present to You A Few Whale and Dolphin Mothers and Babies.